On Friday morning, Jerusalem's first-ever marathon has kicked off despite Wednesday's bus bombing near the starting point of the race's route. Jerusalem's first-ever Marathon kicked off in front of Israel's Knesset at 7:00 AM local time on Friday, Sport 1 television reports. An estimated 10,000 participants from 40 countries ran the course through the world's holiest city, which ended in Sacher Park. Runners of all kinds, religious, secular, young , old, athletes and beginners, all took to the streets of Jerusalem. The Old City and Tower of David can be seen in the background. 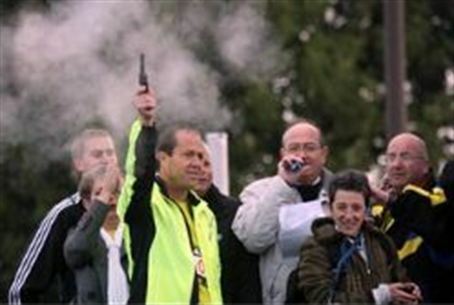 “Our answer to the murderous terrorists is that we will never stop running marathons”, Jerusalem mayor Nir Barkat said in response to Wednesday's bus bombing in Jerusalem that claimed one woman's life and injured 30 more near the capitol's central bus station, at the Marathon’s gala dinner on the evening of the attack. Jerusalem has hosted a half-marathon for twenty years. Mayor Barkat, an avid runner himself and veteran of five marathons, saw fiscal advantages to bringing the 26.2 mile race to Israel's capital after running the New York Marathon last year, “The marathon is an important economic driving force for the city and will bring many runners and spectators to the capital." Both Israelis and visitors from around the world participated. Major city streets were shut down to all traffic during the busy early Friday morning rush hour as the runners took over. Banners, posters and ads were placed weeks ahead of time announcing the event. The marathon is expected to boost tourism, which has been improving steadily, with 3.5 million tourists visiting Jerusalem in 2010. The Jerusalem Municipality announced hotels are booked to capacity with 4,000 runners and journalists from the international media in town for the event. A man carries the flag of his Israel Defense Force unit as the marathon goes past the Old City of Jerusalem. The walls and the Tower of David can be seen in the background. A man carried an Israeli flag as runners go past Liberty Bell Park. The marathon route allowed participants to take in over 5,000 years of history with “phenomenal” and “breathtaking” views according to Barkat. The marathon route was planned to pass the Old City, Mount of Olives, Sultan’s Pool, Ammunition Hill, and other sites. Some have noted Jerusalem is, perhaps, Israel's hilliest city. Elite runners competed for $11,500 in total prize money, to be divided between the top five finishers, and bonuses for men breaking 2:22:00 and women breaking 2:40:18. There is $5,000 at stake for half-marathoners and $3,000 on the line for those running the 10-kilometer race, both of which started at 8:00 AM - one hour after the full marathon began. Runners job past the Mamila center and a banner announcing the marathon. The first-ever Jerusalem Marathon ended in some confusion on Friday, just over two hours and twenty-six minutes after the starting gun, when the three leading runners took a wrong turn and arrived at the wrong finish line. The first runner to arrive at the actual finish line was Robert Cheruiyot of Kenya with a time of 2:27:48, but later on Raymond Kipkoechh, 34, of Kenya was announced as the official winner with a time of 2:26:44 after going off the course and arriving at the finish line of the half-marathon in a different location. The winning female runner was Oda Worknesh, 26 from Ethiopia with a time of 2:50:05. "This is a tremendous day for the entire city of Jerusalem," Jerusalem mayor Nir Barkat said. "The whole city is a winner today." Article by Gavriel Queenann, photos by Ben Bresky.